1. There is no historical data specifying the date Marmaris founded. However, the earliest known name of the town was Physkos. 2. Greek historian Herodotus stated that had been a castle in the town since 3000 B.C. Not to be confused with the current castle though, which was rebuilt from scratch during the reign of Suleiman the Magnificent in 1522. 3. Although the local population of Marmaris is around 40.000, it peaks at 400.000 during the summer. Yeah, that’s right, it’s tenfold! 4. Nimara Cave in Heaven Island near Marmaris had been used as a place of worship since the ancient times, but the human presence was thought to date back to 3000 B.C. until the Municipality of Marmaris executed archeological excavations, only to find that it dates back to 7000 B.C. 5. 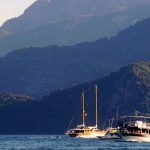 Visitors mostly think of Marmaris as a beach resort with a lively nightlife, but it also has a vast national park that expands over 70 acres of land. Off-road and horse safaris are both great ways to experience it. Did you know any of these facts? Can you think of anything we’ve missed? You can visit Travel Blog Directory for more facts about Marmaris and info about travelling.